Removable wall decals leave no residue and don’t peel paint. They are also very easy to apply, and don’t require any special tools for installation. Custom wall decals are great for short-term retail promotions, and allow you to expand your branding to surfaces that are often overlooked and deliver your message without adding clutter. 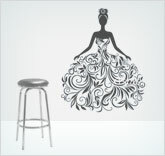 Custom wall decals can also be used to decorate homes and offices. PrintPrint can offer a wide variety of full colour, custom size wall decal options. Contact us to get an exact quote for your wall decal printing today!